Archeologists of Shadows is beautiful to behold. 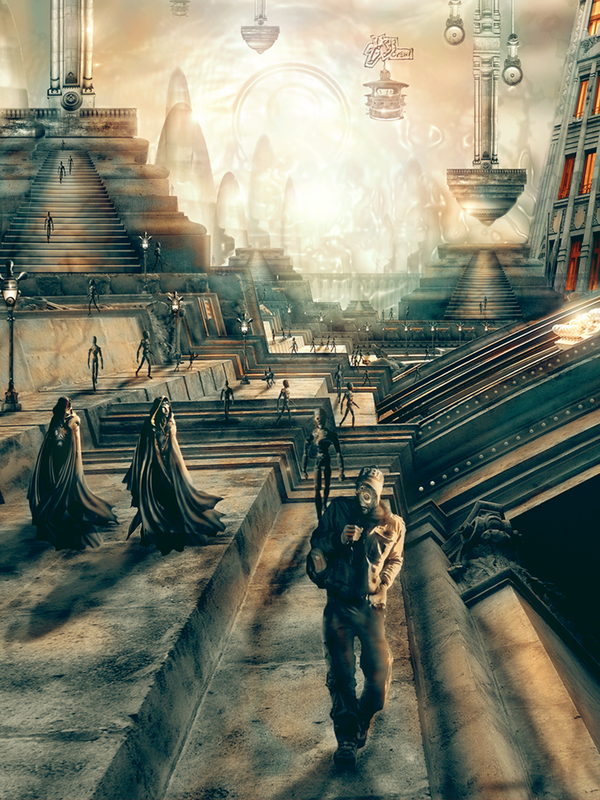 The art in this “science fiction/fantasy/steampunk mash-up” is absolutely breathtaking. Artist Patricio Clarey has created fully realized worlds of such intricacy and depth that I found myself lingering over almost every page, taking in each and every little detail and nuance. Argentinian born Clarey's art is certainly reminiscent of the work of Dave McKean or Menton Mathews III, but it has a life all its own. 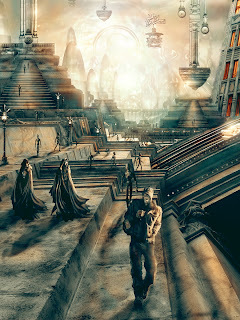 The publishers, Septagon Studios, describe it as a “unique style that combines drawing, sculpture, photography, photo manipulation and digital painting to create art that has a 3D quality.” Clarey's layouts, color palette, perspective, and pacing are innovative, elegant, and stunning. His art is a perfect match for the story the book undertakes. Baltimo and Alix, who’ve lived their entire lives within the No-Destination Train, get off the train to avoid the Authorities, and to search for the Archeologists of Shadows, an underground group of the Resistance who fight to learn what the real will of the gods might be… but Alix and Baltimo will learn much more than even the Archeologists might have expected. It's an interesting idea and is obviously set-up to follow the classic Hero's Journey/Monomyth in its organization. As well, the concept of the dominance of technology over the organic has an eerie resonance somehow to our world today. While the storytelling moves along at a pretty good clip, Lara Fuentes' writing stumbles a bit, especially when paired with the brilliance of Clarey's art. As Fuentes is from Spain, I assume that English is not her first language, and this may account for some of the stiltedness that I found in her writing. She seems to be unsure as how to let her characters develop, and at times her dialogue seems either forced, distracting, or unnecessary. There is a sort of dull singularity to her voice in the book, which is a shame given the breadth of the characters with which she has to work. But it really is the art that distinguishes Archeologists of Shadows. At the end of the digital copy I read, there are around 40 pages of Cleary's sketches, layouts, photographs, and sculptures which are almost as interesting to go through as the book itself. Septegon Studios promises that Book Two of this proposed six book series will be coming out soon. There was a preview of it in the copy I got and, from what I saw, Cleary's art gets even better. I look forward to seeing where Cleary goes next, both with this book and his career. After reading Archeologists of Shadows, I think you will be too.